FILE - The Uber website is displayed on a phone in London, Sept. 22, 2017. The disclosure also highlighted how far Uber remains from turning a profit, with the company cautioning it expects operating expenses to "increase significantly in the foreseeable future" and it "may not achieve profitability." Uber lost $3.03 billion in 2018 from operations, excluding one-off gains. 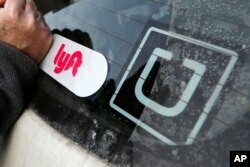 FILE - A Lyft logo is installed on a Lyft driver's car next to an Uber sticker in Pittsburgh, Jan. 31, 2018. In addition to answering questions about the company's finances, Uber Chief Executive Dara Khosrowshahi will be tasked with convincing investors that he has successfully changed the culture and business practices after a series of embarrassing scandals over the last two years.